2013 Leaf Rookie Retro is all about giving collectors a second chance at some of the biggest rookies that may have eluded them, either because of rarity or the fact that their card budget isn't big enough. Every box comes with just two cards. The first is a rookie buyback that's either graded or a signed rookie card that's been verified as authentic and slabbed. Graded rookies cover the biggest names in sports. Collectors can hunt for everything from a BGS 9.5 1986-87 Fleer Michael Jordan to a BGS 9.5 1993 SP Derek Jeter to a BGS 9.5 1980 Topps Larry Bird, Magic Johnson, Julius Erving. A pair of the top cards from the past couple of years are also in the product: a 2011 Topps Chrome Colin Kaepernick Autographed Superfractor and 2012 Topps Chrome Robert Griffin III Autographed Superfractor. 2013 Leaf Rookie Retro buyback autographs are all verified as authentic and encased. Roger Maris, Willie Mays and Sandy Koufax are just a few of the signed cards in the product. Leaf acquired the buybacks off the secondary market to create the product. 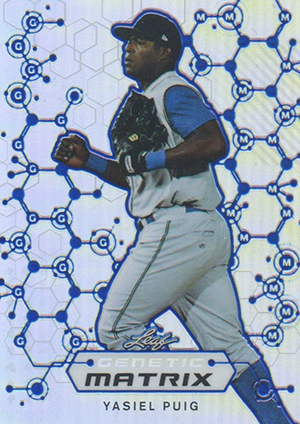 New to 2013 Leaf Rookie Retro are Genetic Matrix inserts. The cards use Leaf's new colored etching technology and come with different parallels numbered as low as 1/1. Genetic Matrix cards are inserted one per box. 25 cards. Inserted one per box. VERY sold names on the high end. A gamble, but a high risk, high reward gamble! is there a full list of the included graded rookies? emeekins � One was not supplied.